Before we get into the “After,” you have to see the “Before” for true appreciation. In full-disclosure, the room was a hot mess that used to half be an office and catch-all space. Now that my girls and I are home more often, I wanted a room dedicated to them, which meant all of the junk and unnecessary furniture had to go. This room is divided into two halves, if you will. I envisioned the space as being a home for my girls. The half closest to the door (Part 2) is the “inside” of the home. The far half is the “outside” complete with a magic garden and Land of Fairy Tales. Without further ado, here it is. These adorable furniture pieces are all part of the Magic Garden collection from Fantasy Fields by Teamson. I love the toy organizer with storage bins because it’s super cute and is a good way to organize and display their toys. The standing mirror was absolutely a must-have for us. 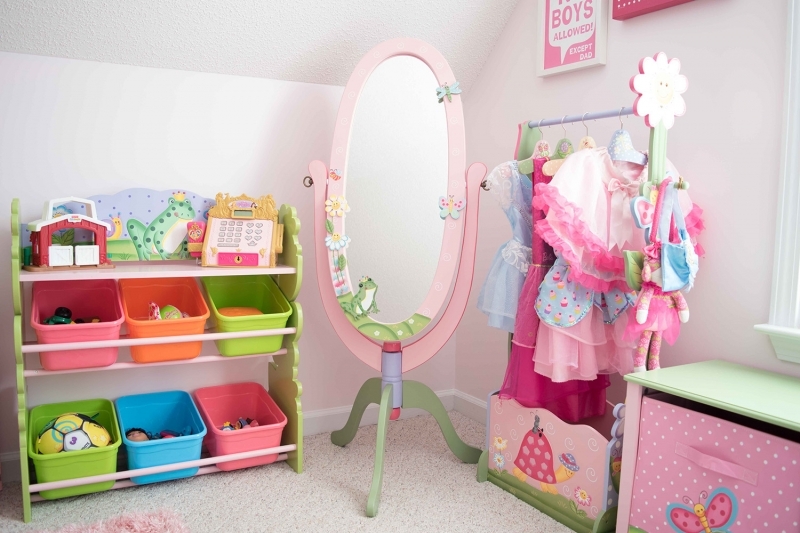 My girls love playing dress-up so the mirror paired with the adorable dress-up storage with 4 hangers next to it were no-brainers. 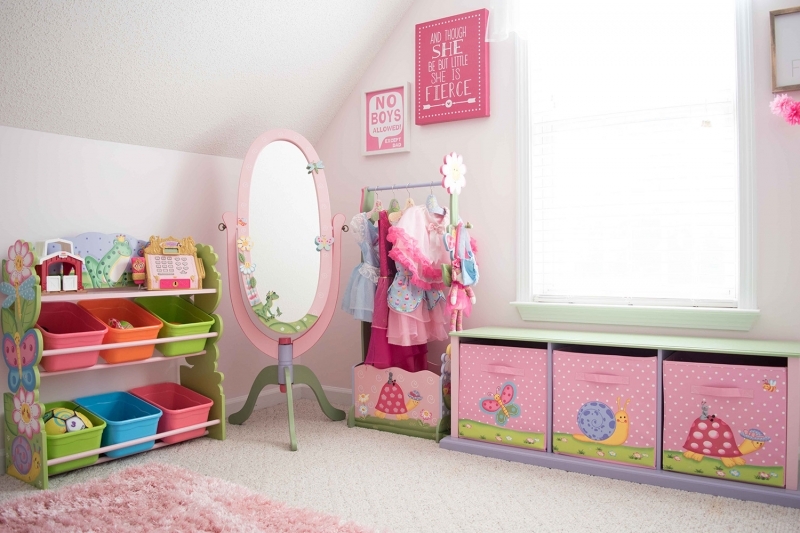 The 3-drawer cubby under the window is a perfect fit and is holding more of the girls’ toys and some of their dress-up accessories like shoes and purses. I mean, how cute is this stuff? This teepee* was the perfect addition for “camping” in the “garden” and it was less than $100! I completed it with these adorable floor pillows from Floor Bloom. I absolutely love how big, soft, comfy, and vibrant they are! The colors mesh perfectly with the Magic Garden furniture. 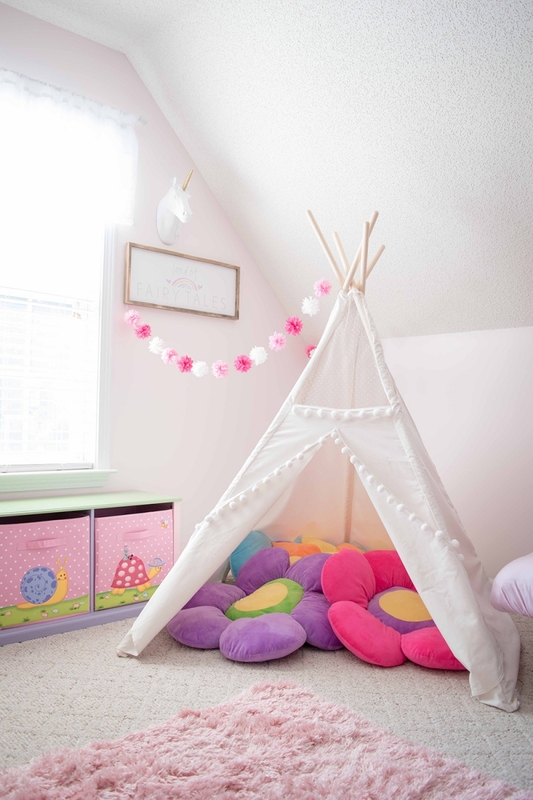 My daughters are seriously obsessed with their Floor Bloom pillows and they are often pulled out of the teepee* and played with in the middle of the floor. We love them. This space has already become a little book-nook for them as well as a fun hiding place. The giggles that come from this corner are the stuff memories are made of. Do you love it? Which part is your favorite? Tell me below! 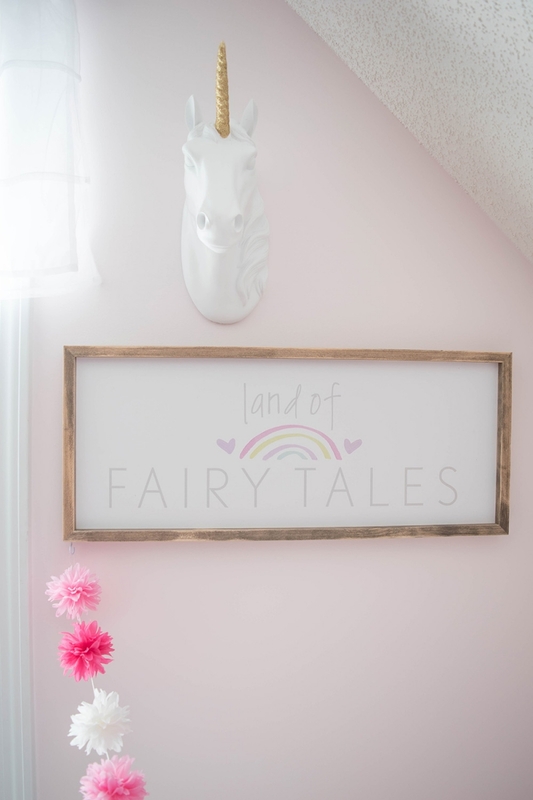 Be sure to check out Part 2 of the Dream Playroom Makeover! Hi!! Thank you so much! It’s Bare Pink by Olympic! Be sure to check out Part 2 to see the rest of the room! This is SO CUTE! 😍😍😍 I love the oversize flowers in this lovely teepee. Thank you SO much! We love those too! This room is amazing! Random question, do you have any idea the dimensions of this room? 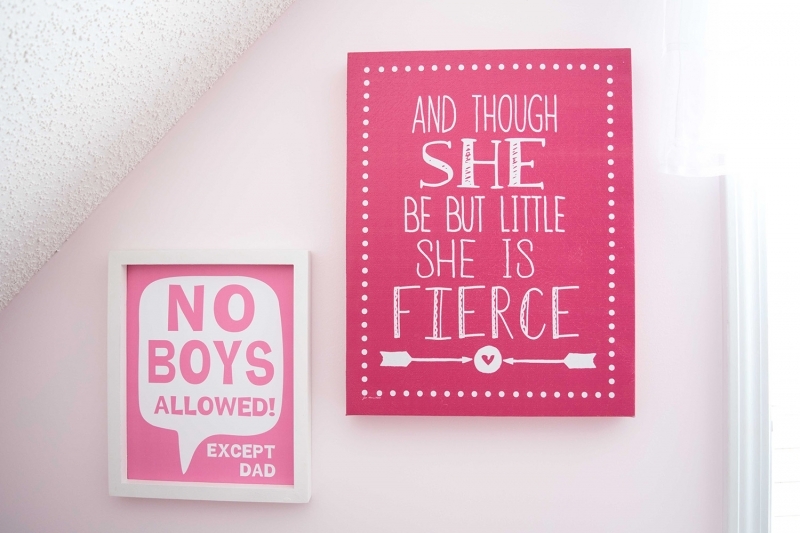 I’m trying to redo my girls’ playroom and Im having such a hard time laying it out. This room is a dream! Hi!! Thank you!! So, I didn’t measure but my husband says it’s about 22×10 (I sits on top of our garage). Good luck!! You did such a great job! Love the choices you made and the colors used. Every little girl’s dream! Aw thanks, Angela!! My girls love it and that makes me so happy! I love the dress up area and the mirror – I would have loved that! Me too! At least I get to live vicariously through them now! Oh no!! I’m sure you can put new cardboard down, right? And yeah – that’s A LOT of stuff to keep track of! Thanks so much!! Good luck!! Adorable! This is any girl’s dream room! 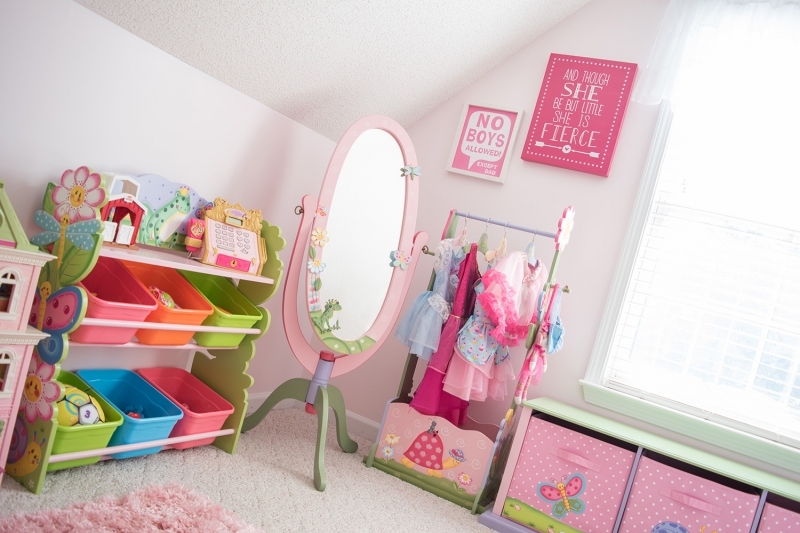 My daughter would love the toy organizer for all her own toys to be kept in her room! Thank you so much! And what girl wouldn’t love having her toys in her room?! Good luck!! My daughter would love this! We would use it in her bedroom to keep her toys off the floor! It’s perfect for that for sure!! I’m OBSESSED with this space. Wait, I’m moving in! LOL! Come on over, girl!! Play date!! Simply dreamy! The teepee tent is my favorite part! Aw thanks!! My girls love it, too! Oh my goodness, I cannot get over the change. Love the pops of pinks everywhere. Thank you! It’s kind of a pink explosion. Haha! Oh my goodness! 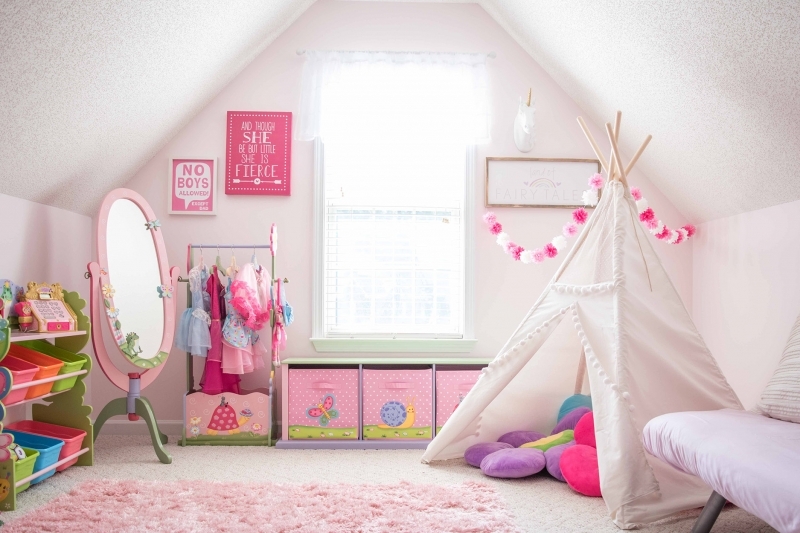 Every little girls dream room! Thank you, Nicole! My girls love it so much! I would have loved it when I was a kid for sure! This toy organizer is adorable! I would use it in my daughter’s room to corral all of her toys. Somehow, she manages to have a couple of full toy bins even though she’s not born yet! Haha. The joys of hand-me-downs! I know exactly what you mean! Good luck!! Thanks! My girls love to dress-up and they look so cute doing it! Love how bright and colorful this room came out! Thank you, Kelly! It’s such a happy space! i LOVE this room, you need to come design a room in my house! Thank you!! Just tell me when! This is so CUTE!! We’re moving soon and I’m so excited to have a real playroom. Definitely going to use some of these ideas! Thank you! Good luck with your move! I hope you love Part 2 when I post it, too! My little Alice has the table and chairs! I’d love the matching set! I would use it for my baby’s toys ! The room is so beautiful ! This is BEAUTIFUL!!!!! How inviting! Love love love it! Gorgeous space Shannon and I bet your girls love it! Great teepee too! I would use this for my daughters small toys! Omg I love it! Soooo cute! Love the unicorn stuff! And that toy organizer would work wonders for my little one’s collection of play food and Potato Heads! Yes! It’s perfect for that! And, thanks! What a cute make-over. You did a phenomenal job! I love that cute Tent, tots adorable!!! Thank you SO much! My girls love it! 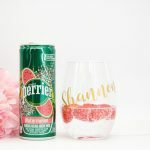 This room is dreamy, Shannon! Love it – great work! Oh my goodness, it looks SO beautiful! 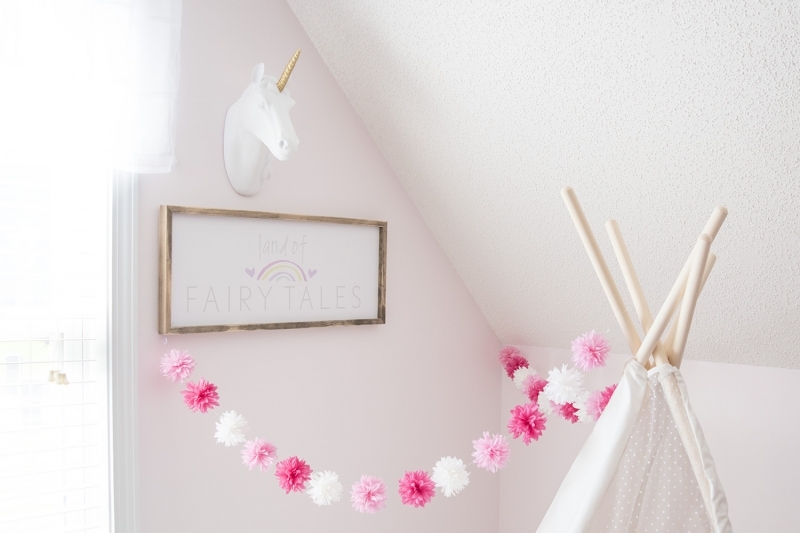 It’s perfect for a little girl! Thank you SO very much!! My girls love it! It turned out SO good! The flower pillow seats are my fave, they’re so cute! Thank you SO much! We love the pillows, too! Ha! Go get one from Hobby Lobby and sneak it in!! And, we do still have the mini trampoline but we moved it out of the room because there was no place for it. And, THANK YOU!! Thank you so much! I definitely do like to sit in there and just look around! LOVE the transformation! I am in the early stages of planning my toy room, this gives me major inspiration! That toy box would be great to have! Thank you!! I hope you win it! And, I can’t wait to post Part 2 so you can see the rest! Can this be my room? 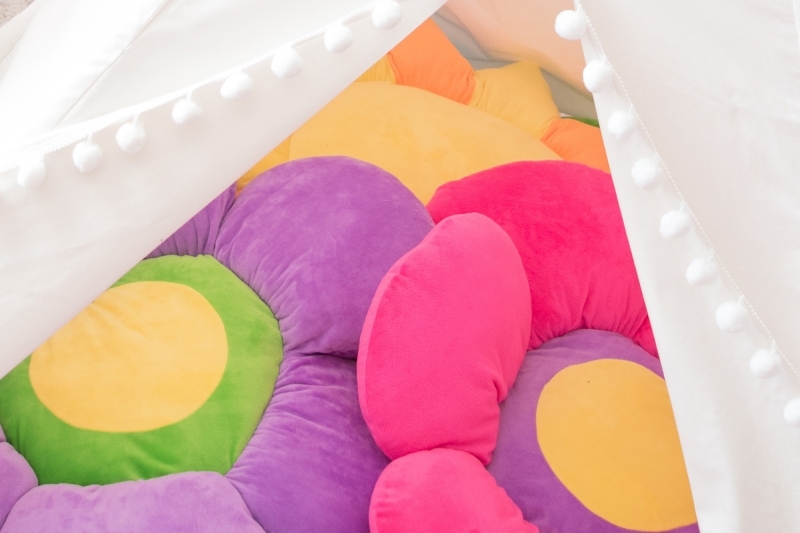 I love the colors and those bright flower pillows are screaming at my inner 80’s kid. Love it! Thanks, girl!! The flower pillows are so fun!! Hi 👋🏼 can I come play here?! It’s perfect! You need to fully stock with Little Adventures dress up clothes! That mirror is the best accessory! Thanks, girl! I’ve got some coming in the mail! !